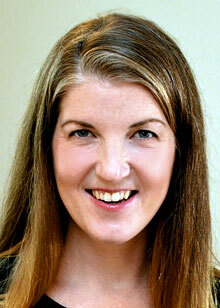 Carrie Tennant is the Artistic Director of the Vancouver Youth Choir. For the past 15 years she has worked primarily with youth, developing leadership and artistry with young singers. In addition to VYC, Carrie has held conducting positions with Chor Leoni, EnChor, the Coastal Sound Youth Choir, and the Sarah McLachlan Youth Choir. Carrie’s choirs have been featured at Chorus America, Podium (Choral Canada), and National ACDA conferences, and have twice been awarded First Place in the National Competition for Canadian Amateur Choirs. During her time with Coastal Sound, their popular Indiekör shows were recognized with Choral Canada’s National Award for Innovation. Currently, on top of her work with VYC, Carrie is an Affiliate Conductor with the Vancouver Chamber Choir, and a frequent clinician, adjudicator and retreat facilitator across Canada. A passionate advocate for building and sustaining community among BC choirs and conductors, in 2010 she helped found the “BC Choral Mentorship Project”: a collective that brings together expert speakers/conductors from across North America with local choral directors for master classes, discussion groups and good food and wine.